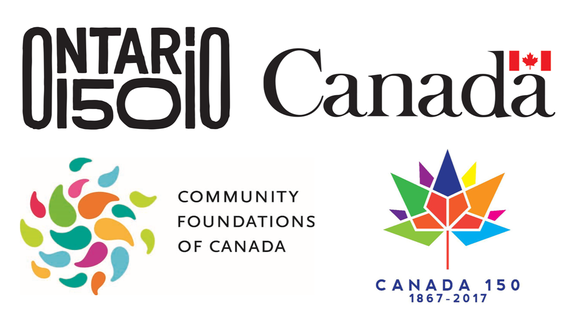 Mosaic Installation Workshop - Registration Now Open! 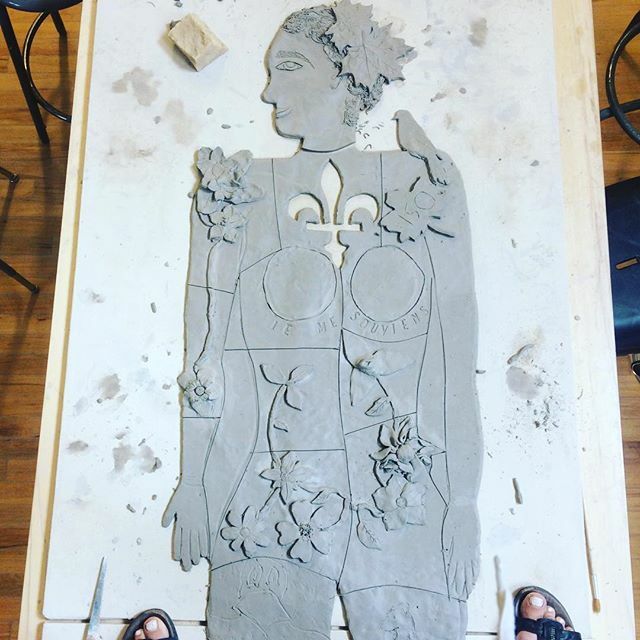 In this 2-day intensive workshop participants will work together to create a lasting, monumental exterior mosaic. We will share all the secrets to installing exterior mosaic murals on a large scale in our climate. Participants will learn about selection and use of materials including mortar, grout - including colourants, handmade and commercial tiles and mirror. After this workshop you will have all the information needed to complete your own projects, from walls, to patios, to decorative items. On day 1 you will mount all of the tiles on the wall according to the design laid out beforehand. 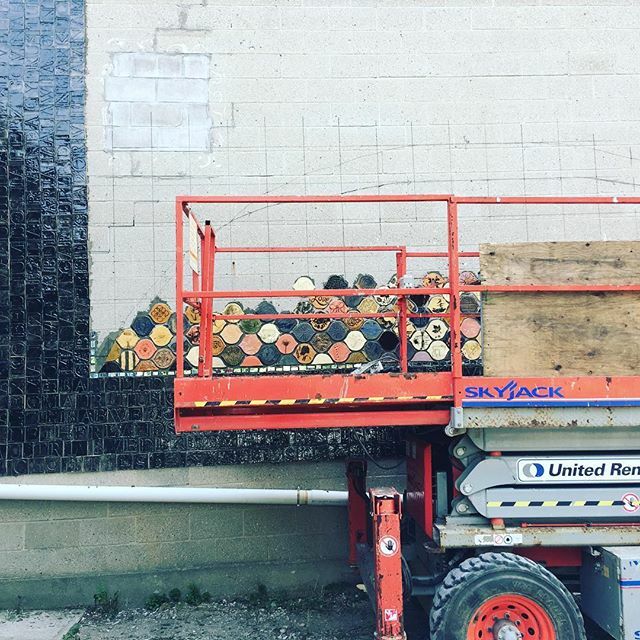 On day 2 you will grout the entire mosaic mural! The workshop will include a tour of LCAC, our other mosaic projects and short participatory demonstrations on tile making and mirror cutting. 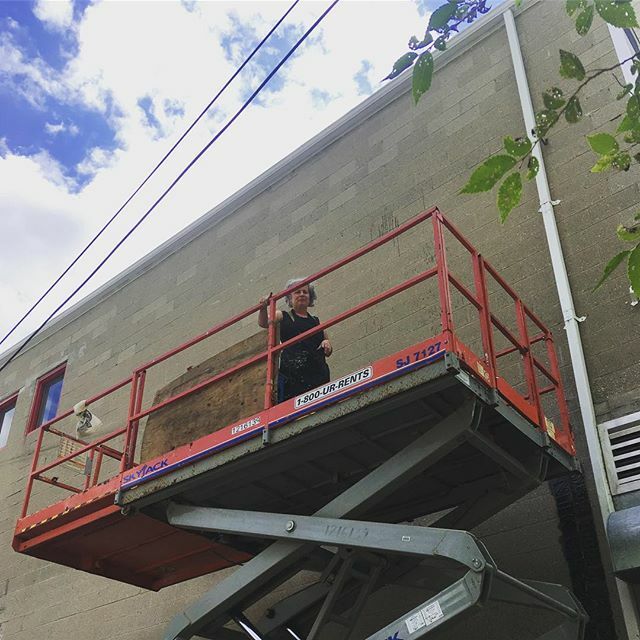 Participants will leave having completed a beautifying, lasting, monumental artwork in Old East Village and always be able to say “I helped build that!” It’s an unforgettable experience of a lifetime! Photo shows the mosaic mural that we helped create during our weekend workshop in Philadelphia. Fee: $225 for LPG members, or $250 for non-members + hst. Includes all materials and supplies. Participants should bring hats, sunscreen, refillable drinking water containers, sunscreen, lunch (or be prepared to visit one of our many local restaurants), clothes that can get dirty (like jeans and t-shirt) and/or an apron. Enrollment is limited to 12 spots. Times: 9-4 each day, with a lunchbreak. 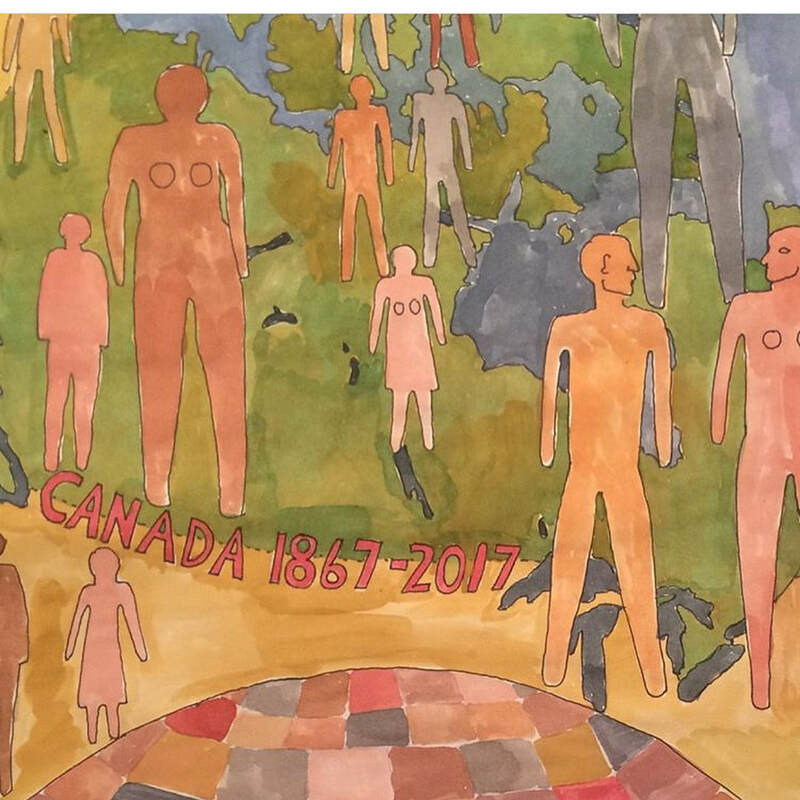 The London Potters Guild’s Celebrate Canada 150 Mosaic is complete! 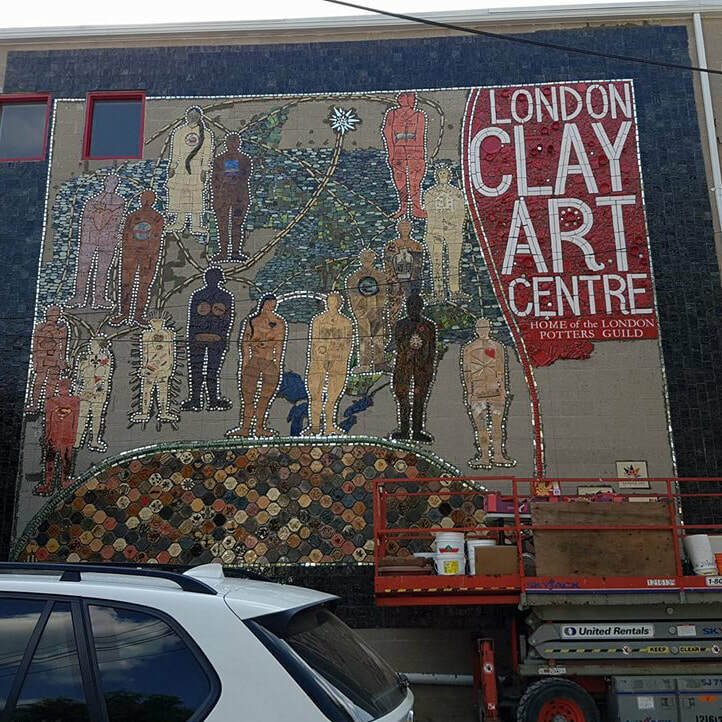 In an eight-month period Susan Day and Beth Turnbull Morrish created the design, then made, glazed, and fired thousands of clay tiles with help from hundreds of volunteers at community events, then finally installed the tiles on the east exterior wall of London Clay Art Centre at 664 Dundas Street. 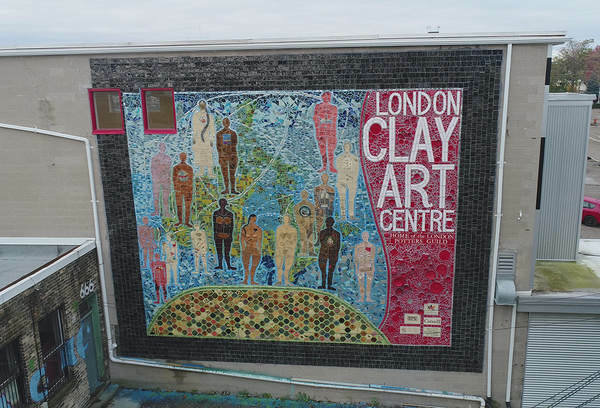 The London Clay Art Centre’s Celebrate 150 Mosaic is a legacy art installation. Its monumental presence contributes to the vitality of London’s Old East Village and will be a source of civic pride for generations of Londoners to come. 650 volunteers participated in tile making, from 25 groups and events. If the tiles were standard 4” tiles that would be 8100 tiles; many of ours are much smaller than that! The main image is made up of 17 human figures, each almost 7’ tall, each made by a different community partner group. 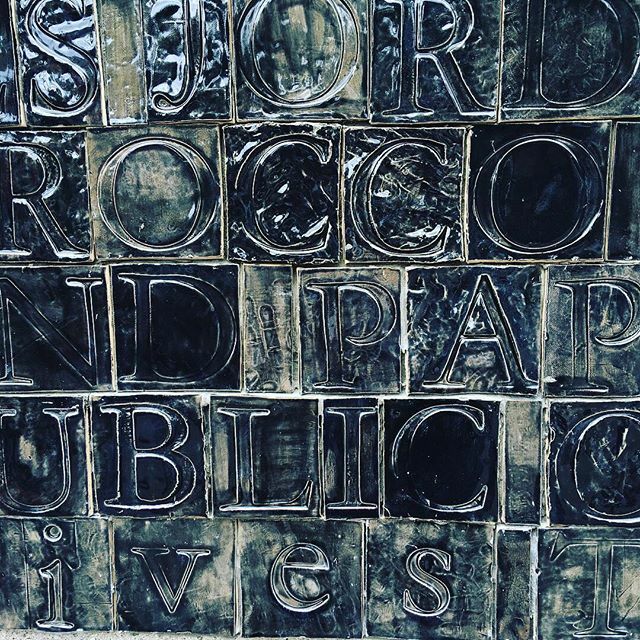 The human figures are over a map of Canada, made up of blue and green tiles, some impressed with names of bodies of water, and green tiles, some impressed with place names or native plant names. 2400 black letter tiles make up the border, spelling out the names of all the indigenous nations of Canada and all the countries of the world. Over 400 individuals made tiles to make up the turtle shell design. Only about 200 were included due to space limitations, nevertheless, they are all beautiful. Hundreds of pieces of pottery were donated by London Potters Guild members and glazed red for the signage section. Susan Day has built a career as a ceramic artist exploring her interest in the human body and its interactions, and her love of the painted ceramic surface. Susan's work has often been political and difficult and has generally been executed as large-scale images on handmade ceramic tile installed in public places. Susan studied at BealArt, ArtsSake, and the Nova Scotia College of Art and Design, and has been a resident artist at The Banff Centre and The Archie Bray Foundation. Beth Turnbull Morrish is a potter who creates beautiful functional wares embellished with text and pattern that are a pleasure to use and elevate the everyday rituals of eating and drinking. Beth is a teacher, technician and long-time member of the London Potters Guild who enjoys sharing her passion for clay. Beth studied at BealArt before earning her Bachelor of Fine Art with a major in Ceramics from the Nova Scotia College of Art and Design.